Back in the day, Tysondog “could have been a contender”, as Marlon Brandon once said. The five-piece from Tyne & Wear collectively had one eye on Judas Priest and the other nine on producing classy Eighties British metal, and their no-nonsense approach was showcased on two cracking albums, two singles and an EP before they took a one-way trip to the vets. They re-appeared in 2012 with a new four-tracker ‘Hammerhead’, and with Jeff (Mantas) Dunn sitting behind the glass they ventured back into the studio in 2014 and re-emerged with ‘Cry Havoc’, their first full album in almost 30 years. Was it worth it? Yes it most certainly was! 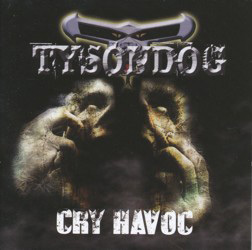 ‘Cry Havoc’ (“and let slip the dogs of war”, to run the full Shakespearian quote from Julius Caesar) is a massive album, crackling with more tension than a Cardiff pub on a Saturday night and crammed with more excitement than the ensuing fist-fight. And if Tysondog 2015 look like a bunch of battle-scarred mofos from the school of hard rocks, knocks and shocks, that’s because that’s exactly what they are. ‘Cry Havoc’ features vocalist John Carruthers, guitarist Paul Burdis and bassist Kev Wynn from their debut 1983 7” ‘Eat The Rich’ (well, from the B-side ‘Dead Meat’ to be more specific), more than ably assisted by guitarist Steve Morrison and drummer Phil Brewis. This ’Dog’s been the block more than once and has gained the experience to be able to show the young pups what it takes to produce a gritty yet stylish slab of metal which, while staying true to its roots, still embraces the growth of the genre in the twenty-first century. Songs like ‘Into The Void’ and ‘Cold As Ice’ are as unstoppable as an avalanche; the bass-driven ‘Nemesis’ explodes into a neck-breaking hard-as-nails riff monster, ‘Shadow Of The Beast’ ups the tempo and grabs your attention by the scruff of the neck, and if you don’t get with the beat and end up drumming along to the title track, dial 999 and check you’ve still got a pulse. It’s also a nice touch that Alan Hunter and Rob Walker, both of whom were key players in the band’s formative years and both of whom played on the ‘Hammerhead 2012’ CD, get a credit for the contributions to the band over the years, and to end on a misquote of Churchill, for Tysondog this is not the beginning of the end; this is just the end of the beginning. Trust me on this.